When should I use one-to-one nursing for a patient with dementia or delirium? A hospital admission can be bewildering for people with dementia or delirium. Staff can have difficulty managing what they perceive to be unsafe behaviour and so adopt one-to-one nursing to minimise risk. However, one-to-one nursing is often applied haphazardly or is not managed robustly enough to ensure efficacy and cost effectiveness. Some organisations have policies to guide staff about when and how to apply observation, but these are often in place to minimise organisational risk rather than to consider the needs of the person experiencing distress. Despite the frequently reported use of this intervention, little evidence supports its use with older people. A ‘disappointing’ literature review by Dewing (2013) did not identify support for the practice. For one-to-one nursing to have value, nurses should consider when and when not to use it, how to avoid its use, who should undertake it, the legal considerations and, most importantly, how to make it therapeutic for the person involved. Why does the behaviour occur and what are the contributing factors? Has the effect of pain, sensory impairment, communication deficits or other unmet needs been considered? Has this happened before and what helped? How are we influencing the behaviour and how have we tried to reduce it? Can we alter the environment or ask the family for help or insight? How could one-to-one nursing help/hinder? What are the likely risks if it is not applied? Will being observed serve to increase distress? What is the desired outcome and how will one-to-one nursing help to achieve it? It is a sad fact that temporary, under-skilled staff are asked to undertake one-to-one nursing and support the most ‘difficult’ or ‘challenging’ patients over lengthy periods of time. People benefit from being cared for by someone who knows them, their histories and their families. The legal position cannot be ignored. As Buswell (2015) noted, continuous supervision or control and restriction of the right to leave may represent a deprivation of liberty of a person who lacks mental capacity. In such cases, Deprivation of Liberty Safeguard authorisation must be considered. If special observation is necessary, there are many ways to work with confused people to distract them from distress. Sometimes silence and touch may be required, sometimes a considered activity. Cheeseman (2015), for example, describes how the use of Twiddlemuffs has had positive results. 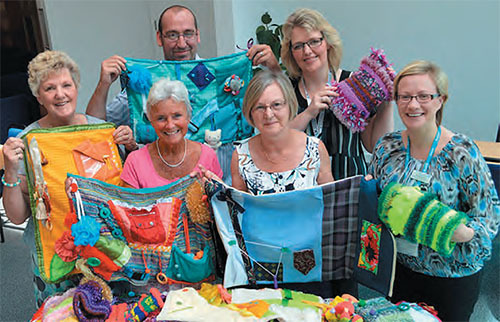 Their use and the use of comfort blankets are being piloted further at Surrey and Sussex Healthcare NHS Trust. Person-centred care to identify what is influencing a person and what may help is crucial. The factors will be many and varied, but are likely to include unmet needs, misperception, distress at being in hospital and interventions ‘being done’ to them. In all cases it is essential that nurses try to understand why people behave as they do and endeavour to address the underlying causes, rather than assume there is something about them that must be ‘managed’ for the sake of safety. Carefully consider what is happening and why. Consider how the person is feeling. Try to change the trigger to the behaviour and alleviate the distress. Use regular staff to undertake interventions. Provide therapeutic intervention alongside observation.